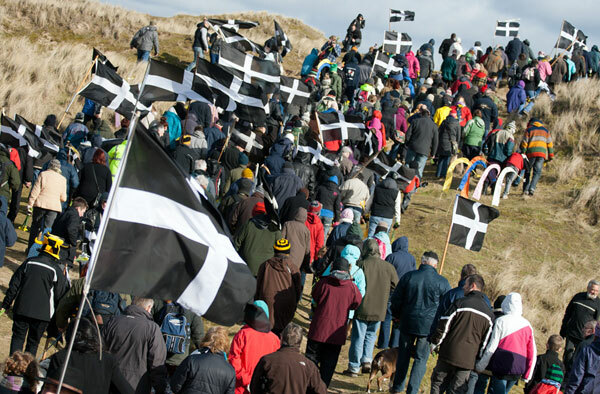 “a white cross on a black ground [that] was formerly the banner of St Perran and the Standard of Cornwall; probably with some allusion to the black ore and the white metal of tin“. 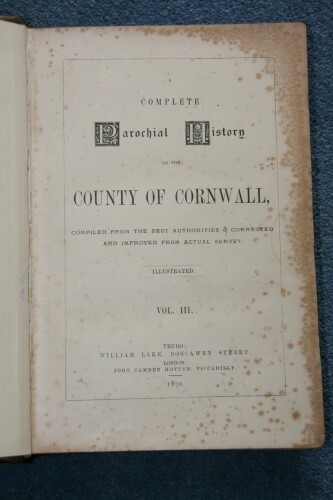 ; a description that both informs and confuses because it’s unclear why he believes it to be “formerly” the “Standard of Cornwall” and does not indicate any time when it may have first been raised or named. Significantly though, this is evidence that the land of the Cornish was represented by a distinct flag decades before banners of arms or application of local symbols in flag form, appeared for other counties. The flag’s singular provenance reflects the unique character of the territory it represents. ; albeit that it has been revived by enthusiasts in the modern era. while the black is the fertile, peaty soil which contains it. Another explanation describes the white light of truth shining through the blackness/darkness of evil! and is famously included in another window at Westminster Abbey, unveiled in 1888, in memory of the celebrated Cornish inventor and engineer, Richard Trevithick. The flag features amidst a tableau, depicting an assemblage of saints, with Saint Piran at top left. , carries a Cornish flag. region of Brittany. The earliest evidence of this design, “sable, a cross pattee argent” dates from the fifteenth century. 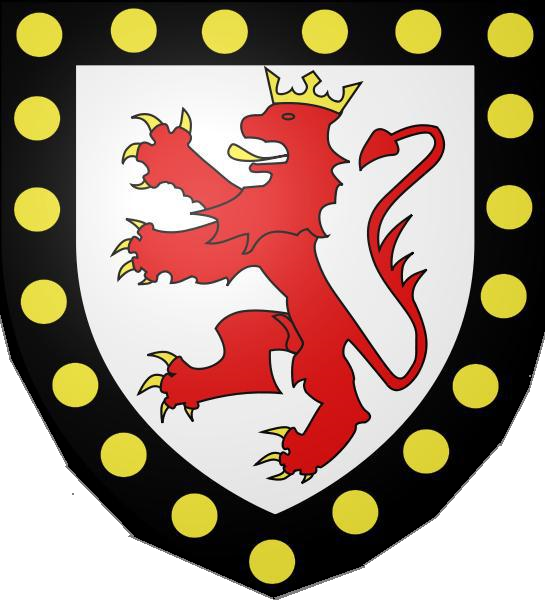 Thus we have a family named Saint Peran, hailing from a place named Cornouaille (directly named for Cornwall as a result of the influx there of emigres fleeing the Anglo-Saxon incursion into their territory) bearing a white cross on a black background; it does seem highly probable that this is the source of the Cornish flag. In the twentieth century a very similar flag, black with a gold cross, started to be used in Wales, originating as a symbol of the Church in Wales. While the similarity broadly appears to be coincidental one wonders if the colours and arrangement are in any way indicative of a general consensus of Celtic association with such patterns and colours? 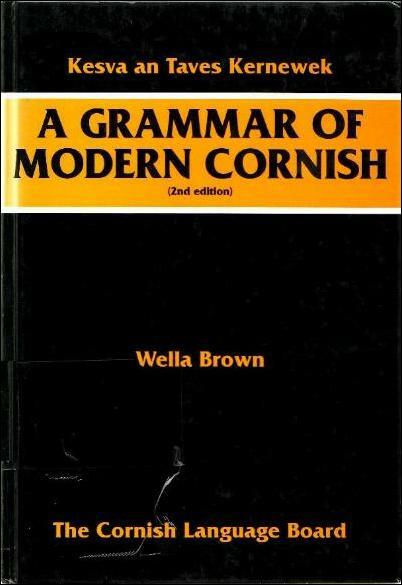 also suggested as possible sources for the colours of Cornwall’s flag i.e. a black background with lighter coloured elements upon it. as it had originally done. 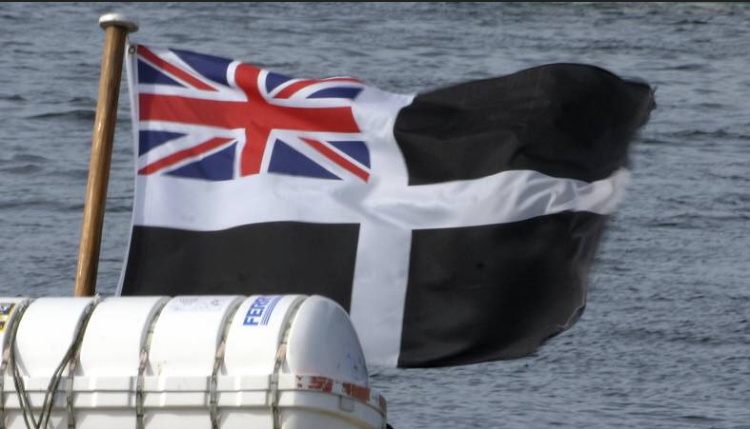 “Following the feedback from our customers…”the store announced , “we’re going to change the Saint George flag to a St Piran on the two Cornish Yarg lines…”.